Large / X-Large - $34.99 Only 5 left! Everyone thinks they know the color pink. But few people really do. It's always been the prettiest color in the Crayola box, sure, but honestly... do you really know pink like you think you do? Really?! We sense much doubt in you. But stop and think about it for a minute. Pink is a mix of white, the color of innocence... and red, the color of danger (if you need a second to recover from having your mind blown, we totally get it). In most places it's associated with femininity, but it's actually a symbol of masculinity in Japan. And according to our research, China didn't have the color at all until making contact with the west. Crazy! See? You're not looking at that little pink crayon quite the same way anymore, are you? It's because pink is mysterious and full of surprises. That's why it's your color... and also why you belong in the officially licensed Adult Pink Crayon Costume this Halloween! With this slick crayon suit, we're absolutely positive you'll be painting the town pink (feel free to use that one, we won't tell) on the big night, even when you meet up with the rest of the pack (like our Red, Blue, Wisteria, Green and Yellow Crayon costumes, because crayons love company)! Made of an easy-to-wear poly-foam, this suit won't hold you back when you're trying to party. In fact, we think you'll end up showing all the other colors how it's done. 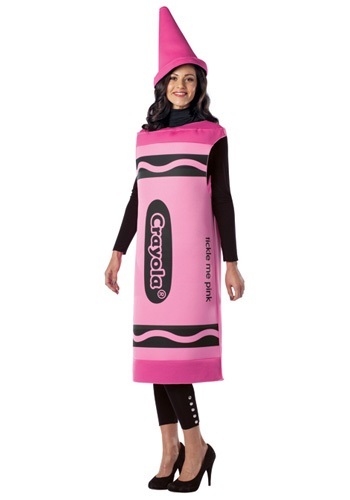 The Adult Pink Crayon Costume is truly for the brightest color on the spectrum! Perfect for student or teacher. I bought this costume for my daughter to wear on Halloween night. The nice thing about this costume is that I can wear it too. I am a teacher. It's comfortable enough to wear all day.